Like many of us, I suffer from indecisive (okay, I believe the correct term is “combination”) skin that can go from dry to oily in a matter of hours. Suddenly, the heavy moisturizer my parched skin so desperately needed this morning is contributing to serious oiliness by 3 p.m. In other words, hydrated, glowing skin has never been easy to achieve. When I mentioned this to my facialist, she said the secret to a highlighter-worthy glow (sans highlighter) is proper exfoliation, not only to remove dead skin cells but also to create a better base to properly absorb your face cream. Moisture equals glow. While I trust her advice, I’ve always found that exfoliating my skin just results in dryness, which results in applying a heavy moisturizer, which results in excess oil—thus the cycle continues. 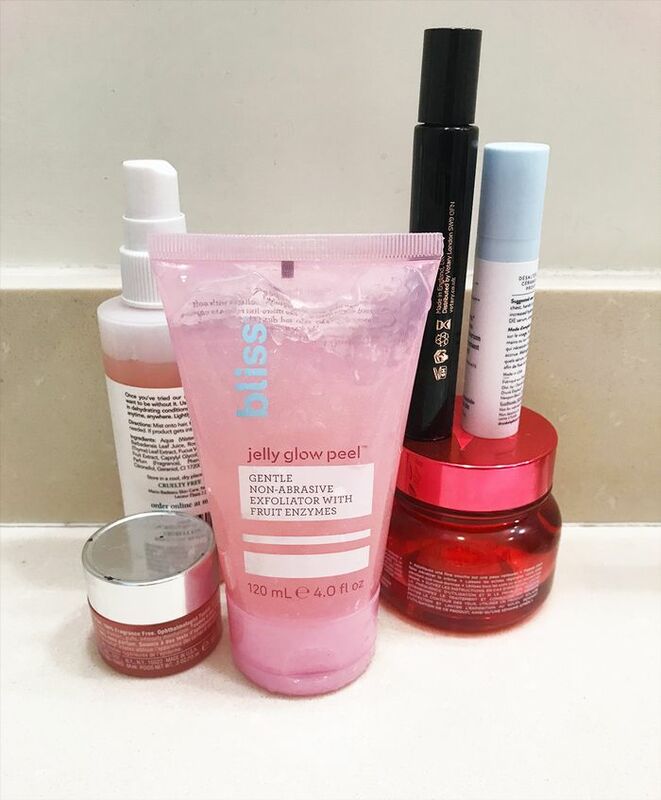 Naturally, when I had the opportunity to test Bliss’s Jelly Glow Peel ($12), I was cautiously optimistic. Yes, I love that it’s cruelty-free, PETA certified, and free of parabens, synthetic fragrance, and other harsh ingredients my skin could definitely do without, but it at the end of the day, it was still an exfoliator. Plus, could a peel that costs less than the salad I just had for lunch really work? I was willing to give it a go. I followed the directions by dotting a dime-size amount of the product onto my cheeks, forehead and chin and then gently massaged in circular motion. My first impression was that I was pleasantly surprised with the texture. Unlike other exfoliants I’ve used, the Jelly Glow Peel is made with soft plant-based fibers, so while I could definitely tell I was removing dry, flaky skin, I didn’t feel like my complexion was being stripped of moisture or natural oils. The jelly base was cooling and hydrating, so much so that I found myself taking extra time to rub it in. The result? My skin felt clean and free of buildup, but not tight and parched like usual. In fact, my skin felt so hydrated and glowy I skipped my moisturizer all together. I’m sad it took my so long to find a solution to balanced glowing skin, but happy that when I did, it came in a pretty pink packaging for only $12. Scroll for my before-and-after photos and to purchase the Jelly Glow Peel for yourself. P.S. it's currently only $9 for the Ulta Spring Haul sale, now through April 20th.